Guess what time it is? Yup, you guessed it. It’s time for another installment of my Educator How-Tos! This week, we’re going celestial with a phases of the moon demonstration. The phases of the moon is an important concept that students must understand. After years of experience, we here at the Museum feel we have refined this activity to the point that it can be taught and understood easily. Sunlight reflects off the surface of the moon to create brightness. The moon produces its own light, like the Sun. No, the moon reflects sunlight, and that is why it is illuminated. Earth’s shadow explains the phases of the moon. This is an eclipse and is a completely different event. The moon does not rotate. This is incorrect. For our purposes, the moon will not rotate in the demonstration, but the moon does indeed rotate, albeit more slowly than earth. The moon does not appear to rotate because we always see the same side. However, the reason we always see the same side is because it rotates exactly one time during each orbit around the earth. People confuse the dark side of the moon and the far side of the moon. There is indeed a dark side, and a light side for that matter, but this is a cyclical event with alternating sides of the moon being dark and light at different times. The far side of the moon, however, is the side of the moon that we never see from our vantage point on earth. Step Two. Ask your audience if they can name the phases of the moon. For our purposes today, we will only be considering the full moon, half moon (quarter moon), crescent moon, and new moon. Special Note: The half moon is traditionally called the quarter moon, but I find it confusing, so I use the term half moon instead. You may handle this challenge in a way that works best for you. Both terms are correct. Step Three. Explain this key concept before you begin the demonstration: There is always half of the moon that is in darkness and half that is in light at all times — regardless of the portion of the lighted moon that is visible to us on Earth. This can easily be explained by calling the dark side “nighttime” on the moon, and the light side “daytime.” Just as on earth, when one side is experiencing daytime, the other side is always experiencing night time. Demonstration. Now you will demonstrate this concept using a bright light source (an overhead projector works well), a blow up Moon (or another light-colored ball that is large) and a volunteer. Pick a volunteer from the audience. Tell the class that the volunteer is going to represent our perspective of the “moon” from different angles. They should envision viewing the “moon” through the volunteer’s eyes. Have the volunteer stand directly to the left of the light source (which is representative of the Sun). The instructor, holding the “moon”, should stand directly in front of the “sun” (about four to six feet away). Now that everyone is in the proper place, you may begin. 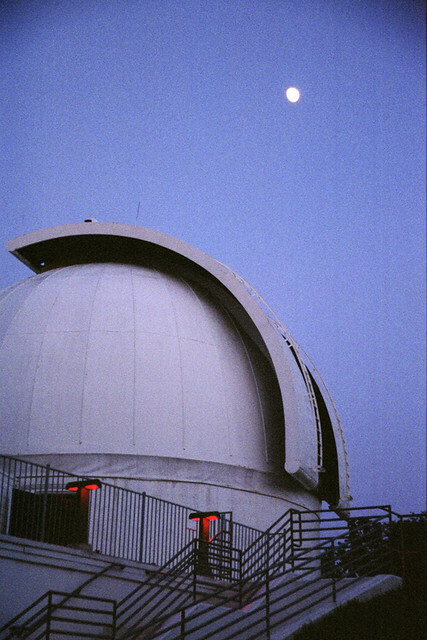 The volunteer, looking directly at the “moon” should describe the amount of light (or darkness) they observe. From this perspective the entire visible portion of the “moon” should be in the light. This is representative of a full moon. When one observes a full moon they are viewing the entire half of the Moon that is in full daylight. Have the volunteer move 90 degrees to the left. Again ask them to describe what portion of the visible “moon” is in the light (or dark). From this new perspective, half of the visible portion of the “moon” should be illuminated. This is a half moon (quarter moon). 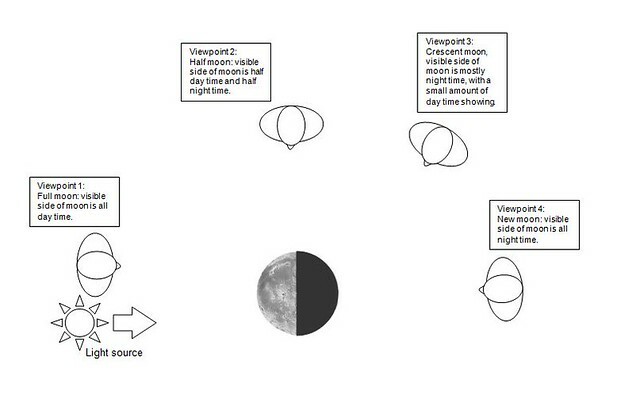 When one observes a half moon they are only seeing half of the moon that is in actual daylight — the rest of the illuminated portion is not visible from an earthbound perspective. The volunteer should move 45 degrees to the left. Again, ask them to describe what portion of the “moon” is in the light (or dark). From this new perspective 1/4 of the visible portion of the “moon” should be illuminated. This is what is called a crescent moon. When one observes a crescent moon, they are only viewing ¼ of the Moon that is in actual daylight — the rest is not visible from an earthbound perspective. The volunteer should now move an additional 45 degrees to the left. The volunteer will now be standing opposite the instructor and the “moon”. Again, ask them to describe what portion of the “moon” is in the light (or dark). From this new perspective, none of the visible portion of the “moon” should be illuminated. This is what is called a new moon. When one observes a new moon, they observing the half that is in “nighttime,” but remember — the daytime side is still on the other side. The moon is always half daytime and half nighttime. As the moon orbits the Earth, our perspective changes and we see different amounts of light and dark area. The appearance of the change in shape is just a change in the amount of lighted side visible from Earth.